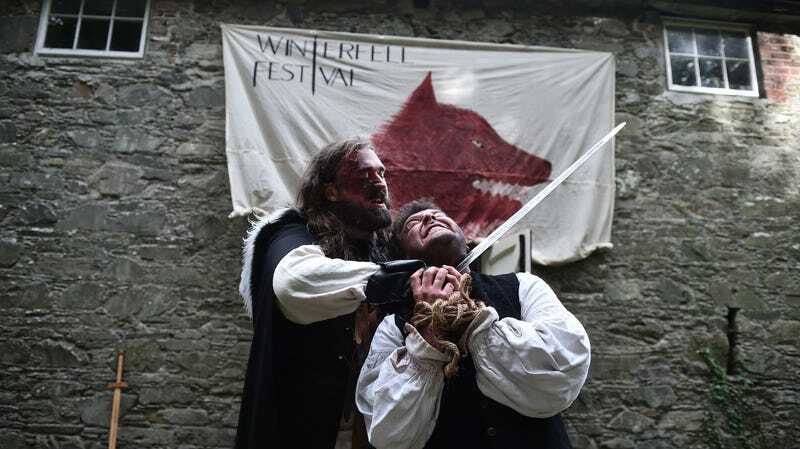 There’s already a “Winterfell Festival” in Northern Ireland. Are you keen to immerse yourself in the world of Game of Thrones? Dying to stand on a rock outcropping featured in the show itself, make a stern face, and announce, “I am Daenerys Stormborn!”? Then you’ll have to book a ticket to Northern Ireland, where HBO is turning filming locations into a proper tourist attraction. HBO announced plans to convert several “Game of Thrones” filming locations in Northern Ireland into tourist attractions. The premium programmer is considering including the standing sets for iconic locations from the show such as Winterfell (pictured above), Castle Black and Kings Landing alongside a formal studio tour of Linen Mill Studios, which will showcase material from the series spanning all seasons and settings. The attractions will be “on a scale and scope bigger than anything the public has ever seen,” according to HBO. And: “Each site will feature the sets from the show as well as exhibits of ‘GOT’ costumes, props, weapons, set decorations, art files, models, and other production materials,” Variety notes. Apparently, they’re shooting (tentatively) for a 2019 opening. Congress to Northern Ireland for playing the long game on this one—practically as long as the show has been on air, they’ve been working to parlay their participation into increased tourism; remember when Queen Elizabeth popped by for a visit? Personally, I cannot imagine anywhere I want to be less than Westeros. To each their own!